If you have wondered how to master your family history research, this site provides you with helpful tips in a video format. John Willis from California has developed a website providing instructional videos regarding various topics of interest to the Genealogist/Family Historian. 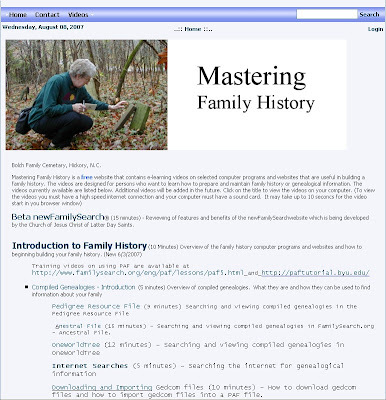 "Mastering Family History is a free website that contains e-learning videos on selected computer programs and websites that are useful in building a family history. The videos are designed for persons who want to learn how to prepare and maintain family history or genealogical information. The videos currently available are listed below. Additional videos will be added in the future. Click on the title to view the videos on your computer. (To view the videos you must have a high speed internet connection and your computer must have a sound card. It may take up to 10 seconds for the video start in you browser window.)" The videos are informative and short in length. The topics range from PAF (Personal Ancestral File), PRF (Pedigree Resource File), Searching the Internet and various other topics. If you are interested in furthering your expertise in Genealogy/Family History work, you might want to see if this site has videos to help fill in the gaps of your learning curve. Please click here to be directed to this site. Have fun learning!